The year 2018 was a ground-breaking year for Italian cheeses with an 8% increase of exports; a history never reported before. The analytics by Coldiretti reveal surprising results: the number one consumer of Italian cheeses is France, followed by Germany, Great Britain, and the United States of America. At the top of the list of the 52 Made in Italy cheeses protected by the European Union through identification of PDO and PGI stand out Grana Padano and Parmigiano Reggiano, the two most requested Italian cheeses in the world. Unfortunately, more exports come with more imitations: Parmesan, Parmesao and Reggianito are only a few examples of the imposter cheeses that rely solely on Italian-sounding labels. A business that, despite the growth in export, continues to cost our country over 90 billion euros; equal to three-times the value of national food exports (source: Federalimentare, 2018). But who is the real king of cheeses? We asked the I Love Italian Food community, the biggest network of Italian food-lovers in the world. A poll launched online, which engaged over 30,000 people from all over the world, and primarily connected food-lovers from the United States of America, Brazil and Europe. 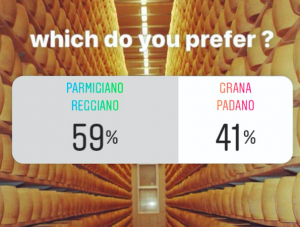 With 59% of the votes, the 100per100 Italian community has declared Parmigiano Reggiano as the cheese most-loved in the world. 1. The area of production: Parmigiano Reggiano is a product that’s exclusively produced in Emilia Romagna in the provinces of Parma, Reggio Emilia, Bologna and Modena, as well as the Lombardy province in Mantua. Grana Padano has a much wider range of production area that consists of Lombardy, Piedmont, Trentino Alto Adige, Emilia Romagna, and Veneto. 2. What the cows are fed: To make true Parmigiano Reggiano, the feed must be exclusively grass grown in the production area of where the cheese is produced. Contrarily, the cows that produce Grana Padano are fed silage (fermented, preserved pasture). 3. 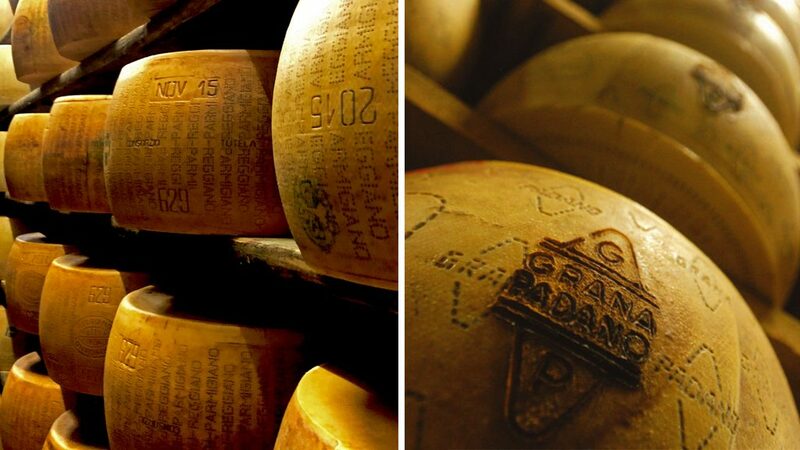 The Production: Grana Padano could be produced with two processing a day, while Parmigiano Reggiano must be produced only once per day. 4. The Rennet: Parmigiano Reggiano must be made with only rennet from the cows. Grana Padano can be made with animal rennet, vegetable rennet, or bacteria. 5. Conservatives: The discipline of production form the Consorzio of Parmigiano Reggiano forbids the use of any conservatives. For Grana Padano, however, the use of conservatives is permitted. Lysozyme is typically used for Grana Padano.